PRAVMIR. June 28, 2012. 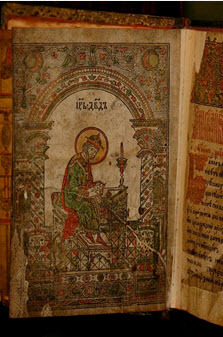 The Joseph-Volokolamsk Monastery is preparing to open the first Museum of the Bible in Russia. The Russian Museum of the Bible was the idea of Metropolitan Pitirim (Nechaev) of Volokolamsk and Yuryev, superior of the monastery in the 1990s. Hundreds of editions gathered over the course of Vladyka Pitirim’s life will serve as the foundation of the museum’s collection, the television station Kul’tura reports. Among the items to be exhibited is a rare 1681 Moscow edition of the famous Ostrog Bible, from Vladyka Pitirim’s private collection, containing a map of the center of Moscow in the seventeenth century. Archimandrite Sergius (Voronkov), the present superior of the Joseph-Volokolamsk Monastery, brought another Bible from Rome specifically for the future museum. One of the most precious items in the collection belonged at one time to Tsar Mikhail Fedorovitch. Today, in the future museum’s three halls, are hundreds of unique books.